Lindoola01485 534267work Self-cateringThis lovely, substantial house is situated within easy reach of the town centre, holiday amenities, theatre and safe, sandy beaches and is proving popular because of its flexibility. The recreational field, children's playground plus tennis courts and bowls are only a minutes’ walk away. Small enclosed conservatory and patio area (approached from the French doors on side of the house). The house can be hired to sleep 7 or up to 12 (please confirm with office - the annexe bedroom is available at £250 per week extra). There is room for a cot in either of the two double rooms in the house. Fully carpeted with gas central heating in most rooms. Entrance into large hallway with cloaks space and staircase to first floor. Under stairs WC. Lounge with TV. Dining room with TV and with two dining tables (adults and children). Tiled and fitted kitchen with electric double oven and door into Sun Room with sink, washing machine, boot/brolly store and room for dog basket, plus French doors onto the driveway. To sleep 7 - first floor landing with three bedrooms; bedroom one has TV, a double bed with shower cubicle and en-suite WC and washbasin; Bedroom 2 has a TV, double bed with step down to small single room. Bedroom 3 has adult size bunk beds with a washbasin. Bathroom with bath (shower over), washbasin and WC. 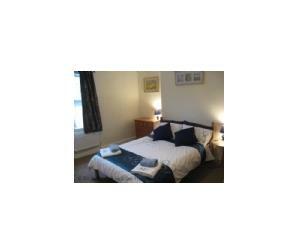 To sleep 7 + 2 + 1 as above plus bedroom 4 having twins and door to en-suite shower room with walk-in shower, WC and washbasin. Small children's playroom with TV and single bed/settee. This lovely, substantial house is situated within easy reach of the town centre, holiday amenities, theatre and safe, sandy beaches and is proving popular because of its flexibility. The recreational field, children's playground plus tennis courts and bowls are only a minutes’ walk away. Testimonial; Mrs W. 25-27.11.11 - Superb, spacious house had everything we wanted for a relaxing weekend get together with friends! A credit to the owners and nice touch of biscuit selection and wine. We could not wish for better.